Our hosting is $275 / month. We need $3300 to pay for hosting for the year, and then we won’t bug you again until 2020. Anything over our hosted amount will be used for upgrades to the site. Look, We had a great run, and it was unrealistic that it would stay that way forever. 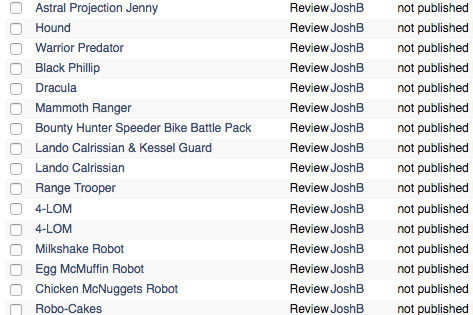 But people move on, get lives, even start their own toy review websites. i’ve been running the site for almost 20 years, and i’m now focusing on other things and I can’t keep paying for it out of pocket. The advertisers have left, and Adsense and eBay don’t make enough. This GoFundMe is to keep the lights on and keep the site from vanishing into obscurity. We will still post toy reviews when we can. But the real value is the thousands of toy reviews and news articles that are constantly being used as reference around the world. Those are in danger of disappearing if costs of hosting cannot be covered. I am not a fan of asking for money. However I cannot continue to pay the hosting out of pocket. This is your chance to show that CollectionDX means something to you, and that you will be sad if it goes away. With your support CDX will live on. Why haven’t you moved the site to a cheaper server? Hosting CDX requires a dedicated server to host the databases for our content management systems, Drupal and Gallery2. Shared hosting platforms put limits on how much server resources you can use, and our use of those systems go over that limit. Despite the low activity, the site actually gets a lot of traffic, and is often under hacking attacks that use a lot of system resources to fend off. Our dedicated host is actually very reasonably priced for what we are getting. Why not move the site to WordPress? There’s no clear path to move our 15,000+ pieces of content and millions of photos over to WordPress, and have it all work, without a large expense that I cannot pay. In short, because of technical issues. If you want to know more, read on. When the site was built, I used an integration of Drupal and Gallery2. Gallery2 acted as an image gallery, which at the time was lacking in Drupal. I used a special connector to embed Gallery2 into Drupal, which made it appear as one site. Our images in our reviews, although viewable in Drupal, are hosted in Gallery2. That special connector is no longer supported, and there is no upgrade path from the version of Drupal that includes gallery. SO, in order to upgrade, I have to convert / decouple / migrate millions of images to a format that works, and then do the upgrade. It would be a very expensive project that I neither have the time or money for. You said you make money off of Adsense and eBay? Why aren’t those paying the bills? The adsense revenue off the site is almost nothing. The money actually comes in through YouTube. A while ago we got hit with over a hundred copyright claims for music used in our reviews that destroyed our earnings on our most popular videos. Our most popular reviewer went into exile, and we made a bad deal with a content network that basically ruined our financial dealings with youtube. We are a member of the eBay partner network, but we’re lucky if we see $20 a month from it. Ad blockers hide most ads anyway, rendering them useless. If we meet our goal, I will remove all advertising from the site for 2019. 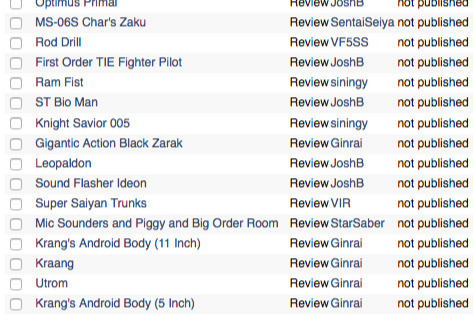 Why don’t you review the big expensive Japanese toys anymore? We got our review items through purchases made with ad revenue, or through agreements with sponsors or manufacturers. We had one advertiser that we exchanged toys for advertising dollars, who screwed us out of thousands for not delivering items we had preordered out of ad budget. Others found more popular influencers to send items to. Either way, lower revenue means less money to spend on toys to review. Less reviews means less traffic, and then that leads to even lower revenue. It’s a snowball effect. What are you doing now that you are not focusing on CollectionDX? CollectionDX will always be my baby, but I have decided to focus on my first hobby, my artwork. CollectionDX took up so much of my life for so many years. I neglected a lot of people in my life, including myself. It even ruined a few friendships. It’s time to start living again. I still love toys, and I will still review some here and there, but on my terms, not when advertisers or sponsors demand it. What can I get if I donate? Well, I’m working on a few perks that people will get, but I’ll be honest, donating is all about keeping CDX around. There’s no shout outs, no exclusive content, no video blogs. You get to live in a world where CollectionDX still exists. What if you don’t make enough? I have a few contingency plans. One idea is to download the archive, work on the site in my free time, and then maybe rebuild it someday. I also have a plan to maybe change a few things and keep a pared-down version of CDX alive with cheaper hosting, but it would require some time. But the current plan is to just shut it down and take a vacation. Maybe I’ll find a patron who wants to host the site for me? Maybe I can find someone to buy the whole thing outright? But in the short term I want to be rid of the financial burden of paying for hosting, so I can be freed up to come up with another option. I just can't afford to run it anymore. So if you love (or even like) CollectionDX, and you've enjoyed the content for the last (almost) 20 years, wont you consider donating? Well, we are into April now and only reached 1/3 of our goal, so I am working on some other options for CollectionDX. I've signed up for a less expensive web host, which will save about $100 each month off of operating costs, but of course setup and migration of the server will add an additional cost, so in the end, the amount stays more or less the same. But if the new server proves stable, it will help in the long run. We're moving to a Microsoft Azure web host if anyone is curious about the technical side of things. Again, thanks for your donation to this project, It means more than I can express. 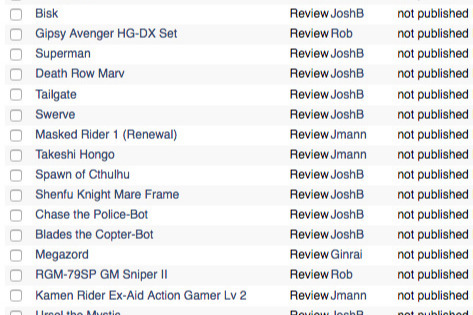 In the meantime I have a few upcoming reviews - Robot Spirits, Star Wars, Transformers and more. The Seige line from Transformers has been particularly awesome! Thank you again for your support! Today I am going to show you our review backlog. These reviews are not finished (and to be fair, some have been sitting here for a year or more) but they should give you a sneak peek at reviews to come. If you see something you want to see sooner than later, let us know! Hey everyone, thanks for contributing! I wanted to give you a quick update on the hosting situation. It looks like we are going to migrate to Microsoft Azure, a cloud hosting platform, that should reduce our hosting bill by $100 per month. Of course there are migration costs, but this should be a positive step to reducing our costs in the long run. Many of you have offered suggestions about alternative hosting, such as dreamhost or even wordpress. Neither appear to be a plausible due to the resources the site needs. Shared hosting is out of the question, so we really need a dedicated host or an affordable cloud solution to stay afloat. In other news, we've got someone covering Toy Fair this year, and we have some reviews in the works for this week, so stay tuned and thanks for supporting us. Words cannot express how much I appreciate it.